Anders Drew a British Expert of Permaculture is making a diagnosis in Atlas Kasbah to implement a conscious & sustainable design and management of the organic garden. He will be our mentor for the next couple of weeks so that we become autonomous as far as food growing is concerned. If you have no clue about permaculture, here is a little introduction. Permaculture is a contraction of permanent agriculture. This expression was created by Bill Mollison and David Holmgren from Australia. It is a permanent high-yielding agricultural ecosystem based on a design that takes into account the interaction between sustainable human settlements and perennial agriculture so as to reduce society’s reliance on industrial systems. Thus, human settlements become as diverse, stable and resilient as natural ecosystems and thrive on as little land as possible, thus leaving more land for wilderness. Every place and community requires its own particular design that’s why Anders Drew helps us to find the design that will suit us (& the land, the climate, the environment…) best. 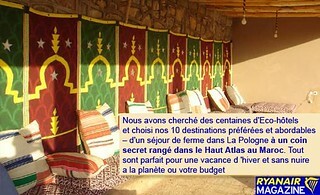 Why permaculture in Atlas Kasbah? The first reason is that we want to grow our own food. This way we know where it comes from and how it was grown. It is definitely healthier for us and for our visitors. There’s also a sense of accomplisment by doing that. A second reason is for our kids. We want the best for them as every parents thus, they can enjoy a good and healthy diet and they learn about gardening through hands-on classes in a kid-friendly garden. A third reason is to increase awareness for permaculture in Morocco as being the only future for agriculture here with the water shortage and the abuse of chemicals in local agriculture. We will keep you updated! So stay tuned!